Ethan Chelberg and other lettering cross-country members. 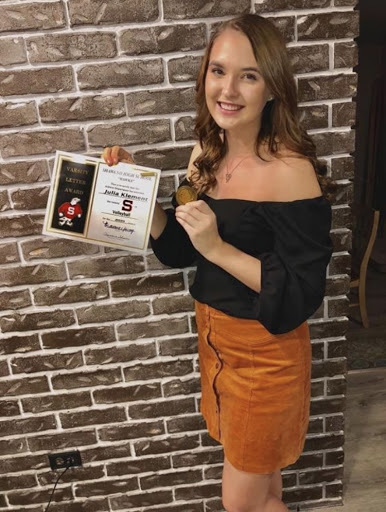 The seasonal Athletic Banquet for Shawano Community High School athletes happened at The Gathering on Monday, November 5. The Student-Athletes, along with their families, were invited to celebrate earning a varsity letter for the sport in which they participated. Senior Julia Klement was recognized at the banquet for earning first-team Bay Conference Co-Player of the Year for Volleyball. 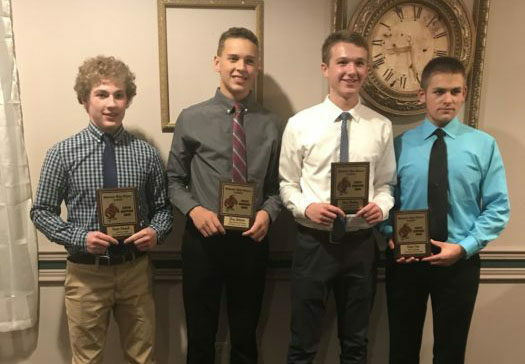 Sophomore Ethan Chelberg also received first team all-conference for Boys’ Cross-Country. Junior Andrew Christian also earned Conference Honorable Mention for football this season. Julia Klement pictured with volleyball letter. Photograph courtesy of Anika Klement. Not only did those students receive awards, but five other dedicated athletes won first team conference for cross-country, ten other athletes won second team all-conference, while 13 other athletes earned Honorable Mention. These competitors showcase what it means to be a Shawano athlete. “It took hundreds of miles of running in the summer to get in shape, which many people on both the guys and girls team did. Cross-country is really about the preparation you do before the season even starts. A lot of us are running five to six days a week from the day that track season ends. It’s really about being in the moment and knowing that you only have one chance to go out and run hard, so you embrace the discomfort and go,” stated Chelberg. For some this was their first ever letter, and for others, this was their last memorable season. Each athlete should take pride in their accomplishments. “It means a lot to earn honorable mention because this is my first ever varsity start on football, meaning I can always improve next year and for my next sport. Our coaches pushed us never to give up and keep pushing. I just pushed myself to get better and better every day whether it be in the weight room or performing,” said Christian. 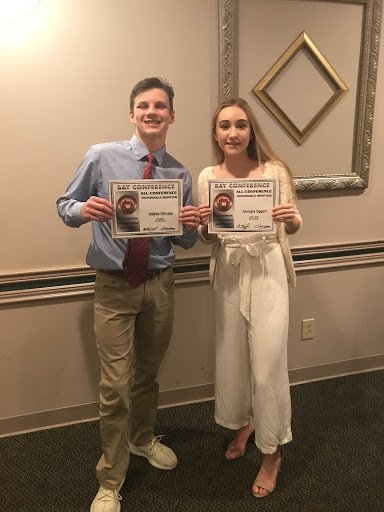 With the support of coaches and parents, athletes were able to celebrate their accomplishments and all the practice that paid off at the banquet. “Overall, my parents are my biggest fans and biggest inspiration. I would not be where I am without their love and constant support. They travel with me seven months out of the year to play club volleyball and have always supported my dream of playing college volleyball. All of the support paid off because I received a scholarship to play college volleyball at Viterbo University, a private school in La Crosse. I see myself as an inspiration of others, and I think I’m a great example that if you set your mind to something and put in the work, you can achieve it,” stated Klement. “I want to try and show people that I may not be a tall and strong guy, but you certainly don’t need that to be good at anything in life,” said Christian. Andrew Christian pictured with Honorable Mention award.